A great pool design is all about a unique shape, stunning flooring and the water within. But adding some visual drama with an infusion of pool water features can turn that design into a work of art. From a pool waterfall to pool fountains, the options are endless for a thoughtful blend of innovative style and technology. If you’re thinking about a swimming pool remodel, today’s pool builders can create custom elements that move water in astonishing ways. Whether it’s a cascading water feature or a cutting-edge automated system, there are plenty of ways to bring your pool environment to life. Busy, tech-savvy and environmentally conscious homeowners are combining form and function with each swimming pool remodel to maximize their enjoyment. Here are some of the favorite options. Combining recreation with a sense of tranquility, these pool water features, built with bubblers, foam jets or sun jets, shoot up out of the pool floor and fall back on itself like a mini geyser or are mounted on a façade. 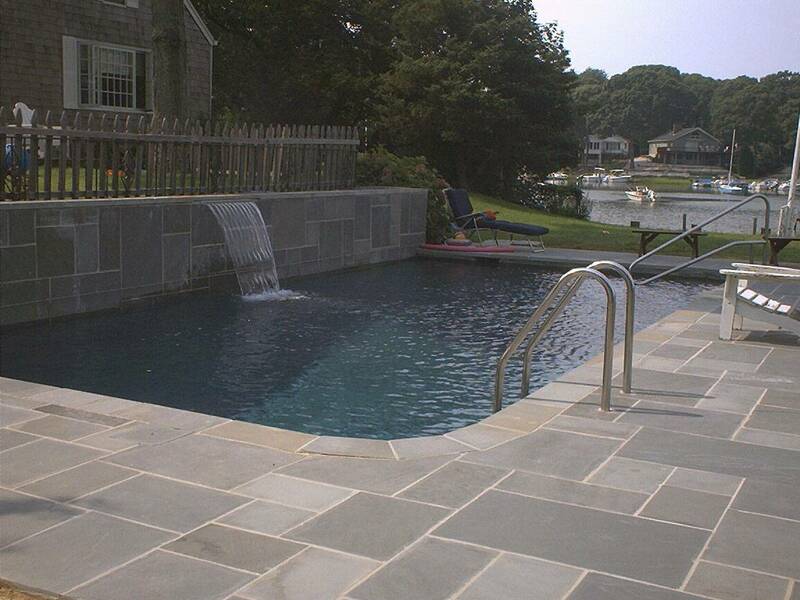 A deck jet is an option that shoots shimmering arcs of water from the pool deck or patio into the pool. From simple pebble work in a wall to dramatic boulders flanking the pool or defining pool fountains, the use of rocks creates the kind of serene and breathtaking atmosphere you’d find in nature. Complete with custom rockwork, a natural waterfall is a more dramatic option to pool fountains, and can vary in size and complexity. A waterflow spillway or sheetflow is another option that adds visual interest and the soothing sound of moving water to your pool. A rainfall curtain is another cascading water feature that uses a series of pencil-like streams to rain down from an elevated beam, creating a “curtain” of water. These decorative objects are mounted on a wall from which a narrow stream of water flows. They’re an elegant architectural detail even when off, and when turned on, the peaceful sound of water splashing transforms your pool experience. The incorporation of fire elements brings your poolscape alive at night, but fire bowls often are as attractive as they are functional in the daytime. Many bowls can be built with a cascading water feature with the flames and pool waterfall operating independently. You get much more out of pool water features when you can enjoy them at night as well. Proper lighting transforms your features, and installing LED lighting can enhance the feeling of serenity. While you may consider elements of a swimming pool remodel to be a do-it-yourself project, you’d be well advised to contact your local pool builder to have it done right. With years of design expertise and knowledge about making the most of your space, a professional pool company can take your pool to the next level.